Chef Lindsey Solberg agrees to cater the church’s Valentine’s Day fundraising banquet as a favor to her teen sister, but she’s shocked to discover the bad boy from her high school days is now Riverbend’s youth pastor. Seriously? How could he have changed that much? Nick Harrison has prayed for years for an opportunity to make amends. Now Lindsey’s back in Riverbend and won’t give him the time of day. What’s a guy to do except leave a trail of gifts from a secret admirer? Lindsey’s heart takes a beating when she realizes the boy who was never good enough is now a far better man than she deserves. 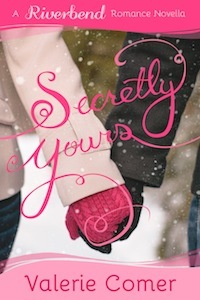 I enjoyed reading Secretly Yours, set in the small fictional town of Riverbend in British Columbia, Canada. Lindsey Solberg hasn’t had an easy life. She returns to Riverbend to help her stepfather care for her stepsister, Madison, following the tragic loss of their mother. Pastor Nick is the reformed bad boy who messed with Lindsey’s heart when they were in high school. Lindsey struggles to believe that he’s a changed man, and she is reluctant to trust him. She’s not looking for romance, and her mother’s relationship history has turned her off the whole concept of marriage. Lindsey agrees to be the chef for the church youth group’s Valentine fundraising dinner, and she’s drawn into an easygoing friendship with Nick. I have a soft spot for reformed bad boy heroes, and Nick didn’t disappoint me. Nick regrets his actions in high school and comes up with his secret admirer plan to win Lindsey’s heart. His faith is strong and he gently encourages Lindsey to explore her own lukewarm faith. Secretly Yours is the first book in Valerie Comer’s Riverbend Romance novella series, followed by Pinky Promise. A sweet Valentine’s Day read, I recommend Secretly Yours to readers who enjoy fun and lighthearted contemporary Christian romance novellas. Learn more about Secretly Yours and the Riverbend Romance series at Valerie Comer’s website. Thanks so much for the shout-out, Narelle! I’m glad you enjoyed Secretly Yours. It’s a lovely story! I enjoyed it too! You know, I didn’t even realize I had a copy of “Simply Yours” on my Kindle! Sounds like a good one that I’ll eventually be able to get to…lol! Maybe I’ll go hibernate for, say, a year and do nothing but read….it may make a dent in my reading pile (real & virtual)! Hi Trixi, My Kindle account is bursting to overflowing with unread titles, too :) I also suspect I’d need to hibernate for a couple of years to make a dent in my print and electronic tbr lists, lol.